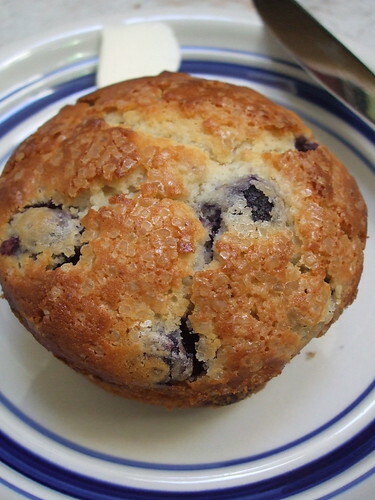 For an updated and much better recipe for blueberry muffins, go to this recipe. I am becoming so domestic. This morning, I woke up before the Chef. Sentences were singing in my mind, with a high-pitched insistence. Reluctantly, I left the bed to write some more, quelling the choir into quietness. After awhile, I was fully awake. After I set a pot of coffee going, I checked in on the Chef. Sleeping sweetly. What was I to do? Read the paper? Curl up with my new favorite book? Go for a walk? No, I did the only sensible thing a gluten-free girl can do. I made muffins. From scratch. I have never made gluten-free muffins from scratch. I have only made them from mixes a few times, and those are fine. In fact, I have one sitting on the shelves of our pantry, right now. I could have so easily dumped that in the KitchenAid, added some butter and eggs, and called it done. But these days, almost nine months after the Chef and I met, I find myself  to my surprise  becoming incessantly domestic. I make lists of projects to do around the home. I spend every evening wiping down the counters so the kitchen is clean before the Chef comes back. When I lived alone, I would let the kitchen go, for days. Who was around to see it? Now that it is his home too, I find that I want it gleaming and clean. And after reading dozens of crafty blogs the last month  especially this one  Im even considering buying this book and teaching myself to sew. Mostly, though, I just cant stop creating food. Certainly, that has been true for more than a year and a half now, since I stopped eating gluten. I have been cooking myself into a new being for months and months. But now, Im cooking for someone else. Top it off, Im cooking for a professional chef, a damned fine one. I have had to face the reality  I will never sear lamb chops or create a fish special the way this lovely man can, no matter how long I cook. He has a gift, a genius, I can only admire. Then again, he stands in awe of my writing, particularly the fact that I wrote an entire book in four months. We both have our strengths. But you see? No one cooks for chefs. Everyone is too intimidated. Unless I let go of the need to be as good as him, the man will never eat home-cooked food. And this is our home. Long ago, I gave up trying to impress him. What I want most of all now is to feed him. Nothing sends out love like baked goods made from scratch. When I was first diagnosed with celiac, I thought I would never be able to make a batch of cookies for a friend, or woo a man with my pies. Now, however, I no longer worry. Ive done enough experimenting with gluten-free flours to know what I want. The bottom shelf of our little pantry is filled with little one-pound bags of millet, quinoa, sorghum, and teff. I love the experimenting. Mostly, though, I love the final product. When I make something new, and it turns out right, I stand in the kitchen and clap my hands, truly delighted. These muffins? They were golden-brown and studded with raw sugar, filled with so many blueberries that some bites tasted like June, and wonderfully warm. When I brought one into the Chef  he had been awoken by the smell of baking  along with a hot cup of coffee, he smiled up at me, delighted. That is the sweetest part of domesticity: the look of love in his eyes. Gluten-free baking truly isnt that hard. All it takes is a desire to play and a willingness to make mistakes. However, over time  months later you will know, instinctually, which flour to use. When I made these muffins, I knew. Sorghum, because that is the base of almost everything I bake these days. It is light and binding, the closest texture to wheat of any of the gluten-free flours. In fact, I use it in almost everything I bake these days. White rice flour, because muffins should be light and airy, with almost no density, just enough to hold them together. Tapioca flour, because some kind of starch works well with these together. (Could have been cornstarch or potato starch. I like tapioca starch here. It has an ephemeral sweetness, faint but perceptible, that I like.) Put them together  muffins. My friend Monica came over for a visit this afternoon, for one last conversation before she returns to New York. She cant eat gluten either. In fact, she was diagnosed because of me  she had the same symptoms, and my experience taught her what questions to ask. I fed her minestrone soup, some of the gluten-free bread, and one of these muffins. Man, you are really getting this gluten-free baking down, she said. I smiled. No accolade at school ever felt so sweet. Combine all the dry ingredients together. Set aside. Cream the butter and sugar together, until just creamed. If you leave the stand mixer running as they are creaming, these muffins will not rise. Simply cream them until combined. Add the eggs, one at a time, mixing after each egg. Add one half of the dry ingredients, mixing well. Add one-third of the yogurt and combine until well mixed. Add one-half of the remaining dry ingredients to the mixture, and combine. Continue this, alternating the yogurt and dry ingredients, until you have mixed both of them in, completely. Add as many blueberries as you can. Oil a muffin tin well, then sprinkle a little cornstarch or white rice flour on the bottom of each cup. Fill each space for muffin two-thirds full. Sprinkle the raw sugar over the top and set them in the oven. Bake the muffins for about 35 minutes, or until the tops have browned and started to harden, and the entire house smells of warm blueberry muffins. If your sweetie wakes up from the smell, the muffins are done. Given the rousing success of your Artisinal Sorghum bread recipe, I will be trying these muffins very very soon. Please keep creating, you have a wonderful talent for it. And though I don’t know you, I am thrilled to reap the benefits, both in devouring your blog posts, and using the recipes. So thankyou. About that bread — I made it tonight for a dinner party. It’s definitely the best GF bread I’ve had. By far. And my non-celiac dinner guests loved it almost as much as me (even the one who had no idea that there was anything “special” about this bread). Which bread recipe are you referring to? Wow, Shauna! That muffin is beautiful. While I love blueberries, I don’t have any in the house but I have a bunch of cranberries I bought and froze, so I might try this recipe with them (and a little more sugar to counteract the tartness of the berries). We thought of you when we saw this article in today’s Boston Globe: Gluten-Free Beer! That is one gorgeous muffin! What makes it special? Gorgeous gluten-free food. Thanks for sharing your amazing recipes, but even more, thanks for sharing yourself. My daughter & I are Celiacs & I am a teacher. You are a gifted writer. Embrace it, and keep sharing it. Through the process of writing you are blessing yourself as well as others. You show others that GF is not about deprivation. I don’t recall who said this but it applies. “To have is riches, but to do without is powerful.” To be GF is powerfully creative! Thanks, also, for your openness & transparency. You inspire others through that. Say “Hi” to the chef for us. Cling tight to your love & make it a priority to always keep it fresh & alive. God bless you two! Ah…yes that wonderful domestic feeling that comes with cohabitation. I hope that he liked the muffins! I am sure he did. Best to you and the chef. I just saw you on foodnetwork…how nice. Congratulations on all of your success thusfar. quelling the choir into quietness…I can’t stop saying it, it’s like rolling something sweet and cold and Q around in my mouth. Shauna, you are effing amazing. I can’t even read more than one sentence you write without your incredible gift for language stopping me dead in my tracks. Man. OK, now I have to go back and read the rest because that muffin looks as scrumptious as your alliteration! Those look yummy. Funny, I have just started experimenting with a new muffin recipe myself. I have been craving my own cooking. I used to make everything from scratch before I started eating gluten free, but all the rules have changed on me. I miss making my own pancakes, I am tired of using a mix, but I am not completely ready to go out there and do it. I have 2 small children (they are eating gluten, but we are eating some meals all the same), so I am not prepared to have to start something all over again. And I have found and tweaked into existence a fast and easy recipe, and if you want to share it here, please do, and if you don’t, I wouldn’t be insulted and I would still visit your blog everyday. It is just such an easy recipe for Moms to whip up, 5 minutes, a few ingredients..so here it is, share if you like, tweak to make it better, I think it is too good to keep to myself.. I add 1 mashed banana, and chopped pecans, and sometimes toasted coconut on top. Just mix up the ingredients and put in a lined muffin tin, otherwise they may stick. Bake 15 min at 400 degrees. I’ll eat most of them fresh, because they’re so good just by themselves. However, I may try my hand at some muffins. I consider making and adapting a lot of your recipes. Have you ever considered keeping dairy out of your diet? I am dairy free, and I have to say that I get a lot of inspiration from you about your reasoning behind being gluten free, and I feel like they go hand in hand. Either way… just a thought. Maybe the next time you stop to make something, you can ask yourself as you add that dairy element in, if there is something that you can substitute? and is it even needed? I got an e-mail from my sister telling me to check out gluten free girl because she saw you on the food network. I told her I already knew about you and have been to your site on a regular basis. She was much impressed that I knew (via blogspot)you. Thanks for leading me to soulemama. I spend an entire snowy afternoon yesterday reading and wishing I were one of her children! I’m eagerly waiting to get sorghum flour to use my Christmas-new Le Creuset dutch oven to produce your beautiful bread. My gosh these look good. I swear I can smell them from where I am sitting! All I can say is—will you come be my personal chef? I guess The Chef has dibs on you, eh? Just found your blog. Haven’t tried the recipes yet, but they’re printed out and posted on the fridge just waiting for the weekend. Ah! These sound divine! Must try recipe… Blue berries are my favourite. My brother was a chef for years, and he complimented me on my cooking one evening, which was huge for me,. Also I dated a chef once, so know the intimidation and insecurity you feel, but what my brother pointed out to me, is that I am a ‘real cook’ versus a chef. Sometimes, after a long hard shift at work a chef wants to come home and have some easy going, lovingly prepared, down home cooking. I am sure that your man appreciates your cooking, and is inspired by you more than you know. And as for the sweet domesticity thing… Darlin’ you’re nesting, and its lovely! 🙂 Enjoy it!!! i am new to the whole blog world, so i am not sure if you even read these… i am a personal chef and gluten-free for about 6 months (mostly, but i dont have celiacs, i dont think…) and am really excited to have stumbled upon your blog. thanks! i am thinking of starting one myself, though i am not sure i would have anything to write that hasnt been said before…sort of like a tattoo… anyway, good work! Just come accross your blog, will save it to my favourite list you have some great recipes! my mum can’t have any gluten and I always run out of ideas when she come and stay with us! keep up the good work! Nat, I am SO glad that the bread worked out for you. I just can’t stop making it now! I’m sure your guests were thrilled. I’m sure this recipe would work for any kind of muffin, really. That’s the beauty of it! Of course! That’s why we are all here — to learn from each other. Thanks for stopping by. Oh goodness, I am so eager to try that beer. There might be some in my future soon…. That restaurant looks fabulous! Much like the Chef’s, really. We are bound to be in Portland soon. we’ll be sure to stop by. Thank you so much for this beautiful comment. I am humbled. I’m still amazed when I think that people are watching me on tv! Thank you! I love the idea that people are reading, and know me from my words, and then see me on tv. So surreal! Do you know, I still haven’t seen it live? Aw shucks. Thank you so much. I read this comment more than once! It’s true, I am a fool for alliteration sometimes. Yum. Those pancakes look great. I have a recipe too, fairly different. I’ll have to do a post about those too…. You know, we all have our own story. After the first couple of months of eating gluten-free, I was able to go back to dairy, successfully. Therefore, I cook and bake with it. I definitely love soy milk, and I eat plenty of meals without dairy. However, since it is not my experience, I don’t want to guess on recipes. However, if you are able to substitute successfully, I’d love to hear about it, so I could share your success with other readers. How cool! I do feel as though you and I know each other, even though it is only through this lovely blog world. Are you ever coming out to Seattle for a visit? Isn’t Amanda wonderful? Although, as a dear friend of mine said today, reading her blog does make me feel bad that I’m not making everything by hand! We all have our gifts, I guess. Thanks my friend. When you arrive, I’ll make a version of them you can eat. Swear. Well, I sort of have my hands full, at the moment, and the Chef wouldn’t be too happy. Would the recipes do? I hope they all work out for you! Absolutely! We are nesting. It’s downright ridiculous, actually. But I love it. And I love serving him my imperfect food. Last night, however, I made a potato-leek soup that made him nearly weep. “This is so good!” he kept shouting. I think he’s rubbing off on me. I want to hear about those muffins! Oh, of course I read the comments! I adore them, actually. And you should start your own blog. It’s not about being the most original. It’s about sharing your own story. Glad to help. I hope your mom approves! I think I may be the lucky winner of the dinner with you at Impromptu! I tried to email you but the link doesn’t seem to be working. You can contact me at lraymond66 at hotmail dot com. Yay! I’m so looking forward to having dinner with you. Baking is really a science. Don’t worry. Try again. Did you do the trick of folding in the yogurt and flours only parts at a time? That really does matter here. Check the temperature on your oven, to make sure it is accurate. Maybe try a little more liquid? It’s worth another shot. Write to me, and we can carry this on email, if you want! I tried to make both of the muffins – yours, and the coconut. PS – The blueberry muffins are going to be a weekly staple. Yum. ps thank you a thousand times for the recipe, every GF muffin Ive tried so far has been a flop with the family. These have had the best texture by far. Isn’t “Eat, Pray, Love” just fantastic? I finished reading it on Saturday and now want to lend it out to half a dozen friends all at once. Glad to see you’re reading it, too, and feeling similarly transported by Elizabeth’s amazing journey. Yay, muffins! 🙂 I think it looks incredibly delicious. And, I have to say that I’ve just found your blog and love it. You have a wonderful way of expressing yourself – a soothing way of writing that I just love. The recipe turned out wonderfully! The only things I added were a dash of cinnamon and 1/4 teaspoon of vanillla. Thank you very much for posting this. In addition to being intolerant to gluten, I also can’t have gum’s, so finding a GF and gum free recipe that actually tastes good was amazing! thanks again! great great recipe! my husband and both kids (3 and 5) have celiac disease. we are only in our 4th month of eathing gf and it feels like things are going to be just fine after eating muffins like these. I tried these this morning and they are LOVELY! I didn’t have sorghum flour so I substituted millet flour, also substituted Brown Cow vanilla and maple for the plain yogurt as it’s what I had on hand. DELISH! This is a keeper. Thanks! Good Morning! I just got done making your muffins and am waiting for them to come out of the oven. Thank you for sharing your recipes with the rest of us and encouraging our culinary creativity. I just wanted to thank you for this recipe. I made it for my husband who has celiac and he was so impressed. I usually hate eating most of the food I bake gf style but these were AWESOME! Thank you from the bottom of my heart and the bottom of my husbands stomach! Thanks so much for this recipe! I didn't have white rice flour or raw sugar but they still turned out great. I plan to share them with my sister tomorrow as she and I are both eating gluten-free. The rest of the family is going to be jealous I'm sure! I made these yesterday so I had a gluten free breakfast option and all I can say is THANK YOU. They turned out light and fluffy and positively delicious. It made my Monday morning positively scrumptious. My favorite part of baking these though was coming home hours after baking and my home still smelled of the home baked goodness. Thank you so much for sharing this recipe. I am thoroughly enjoying the muffins! Yummo … your muffins sound amazing … will definitely be trying them. I made some today from another recipe http://www.allthingscookingangel.blogspot.com … you might want to check them out. I'd had heartburn off and on for years and been on Prilosec for over a year when I decided to try eating gluten-free in early January. It definitely seems to have made a difference. I still have to be careful what I eat, but I improved enough to get off all heartburn meds for a few weeks. Then I got overconfident and drank some white wine and ate some garlicky dip, and I was back on Pepcid. If I'm careful, I can probably get off again. I don't think I have Celiac disease–does anyone know any other reason one would be gluten-intolerant? Anyway, I made these muffins and they're delicious, but very crumbly. I couldn't really get them out of the pans without seriously injuring them. Any idea why? Thanks for your blog–I've ended up here twice, and it does feel like being in a friend's kitchen. That's especially comforting when one's trying to adjust to life without gluten. If you're interested in tips for reducing climate change, see my blog at http://www.carbonlesscopy.blogspot.com. And thanks again. Yum! Followed your recipes, with a few little alterations. I used 1 cup white rice flour and 2 cups Bob's Red Mill gluten free flour. Subbed sour cream for the yogurt and chocolate chips and raspberries for the blueberries. This recipe means a lot to me.When I found it, I had just tossed a particularly gross, gummy, GF blueberry muffin recipe failure in the trash. Which made me (being a Taurus) even more determined to make blueberry muffins, darn it! I'm only at the 6 month GF stage, and so just beginning my foray into GF baking. I have always loved to cook, but it's been a very tough, frustrating 6 months as my ingredient options get smaller and smaller. And being an experienced cook, I'm not used to following recipes and ending up with disasters. But it's been happening. A lot. Yesterday I had my first pizza crust victory. And today, your lovely muffins. Tomorrow at work we are having a breakfast meeting, and I really wanted to be able to just eat a muffin, so that my employees wouldn't feel awkward with their bagels, etc. And these are so delicious, that now I think I'm going to have to share them with my staff! I followed your recipe quite closely, only substituting soy yogurt and omitting the lemon peel. And I took a poster's suggestion of beating the egg whites separately. Such joy in such a perfect little muffin. Thank you! Oh me, oh my! Second time making these muffins and they are delightful again 🙂 Last time I had no yogurt so I threw in buttermilk. This time, no buttermilk, and only a cup of yogurt, so I added 1/4 cup of ricotta and 1/4 cup almond milk. We are just finishing off our blueberries (we picked 20 lbs last weekend) as they are starting to look a little shriveled and sad now 🙁 Many have been consumed, many have been frozen….the remainder became a component of the muffin batter! Since fresh peaches are in season I decided to dice some up and add them, as well as our family favorite spice: cardamom! Yum, yum, yum!!! Who knows what tomorrow will bring? Quite often our play is based on GF son's requests for things he is craving and can no longer have….what a truly delightful adventure it has been! He is feeling sooo much better and we are all much healthier as we are much more mindful of what we eat! My wall oven died a few weeks ago and I can’t afford to replace it just yet. I miss baking, so I pulled this recipe out today, spooned the batter in three mini loaf pans and baked them in the toaster oven. Amounts and temperature were exactly the same as in the recipe – came out great. I only made one slight change. I didn’t have tapioca flour so I used a cup of arrowroot starch/flour (Bob’s Red Mill) instead with no problem. the sun is finally shining….sat on my porch drinking tea while the whole house, and then the front garden, filled with the smell of blueberry muffins. so compelling i decided to stay home from [saturday] work and focus on domestic chores. eating baked goods, mulching, sitting in the sun. oh shauna! look at this post now. Im reading it in 2011… and youre JUST trying your first flours…. I love your blog for that. I love cooking, but am a terrible GF baker. I haven’t attempted making muffins in ages, since a failed batch really set me off. These came out amazingly well. I made a few smart substitutions based on what I had on hand, and will try to follow it more closely next time. I did beat the egg whites and fold in out of sheer fear of yet another ruined batch (and wasted blueberries) so I might keep that change. Many thanks to you and your kitchen bravery – and your wonderful readers who add reinforcing feedback! I want to use this recipe to make two round pans of blueberry cake. What would the baking time be? sugar is a dry ingredient. Please don’t advise to combine all those together then say to add sugar separately. thaaaaaanks. I just made these this morning. I forgot to add the lemon zest, and also threw in a teaspoon of vanilla because my favorite old wheat recipe used to use it. Shauna, these muffins were UNBELIEVABLE. Truly, I’m a little boggled by how great they tasted, the texture-everything. If I had ordered them somewhere I would have suspected I had been fed the wrong thing, but since I made them myself…thanks for the great recipe and endless testing and experimenting you do to make our lives much tastier. Your recipe sounds interesting, but it is not a muffin; it is a cupcake. Muffins do not cream the butter and sugar. That is how you make cake. Muffins use a liquid fat, oil or melted butter, which is added to the dry ingredients all at once. As a pastry chef of 35 years, I simply had to point that out to you. Good baking! Hi! So glad I found your blog. My 6 year old daughter was diagnosed with celiac’s this week, so I am trying to figure this all out. Shauna, I didn’t have all the flours to make your muffins, but I did have coconut flour so I made the muffins Slackermom left in the comments. They are absolutely delicious and extremely easy and quick to make. Thank you all for helping to make this transition easier. I am so glad to have found your blog. I especially love blueberry muffins. I am gonna have to try this one. Thanks for sharing. I just made these and they turned out great! This is the first time I made anything gluten-free and they tasted fantastic (: Thanks for the recipe! Those look soooooooooooooooooooooooooooooooooooo good. I am making them for my school tomarrow. (they are very picky eaters my classmates are) I know they will be a BIG sucsess. These muffins are awesome! The tops browned beautifully when I cooked them. I do think I may have made a mistake somewhere, though. The muffins came out a little denser than I had expected. What could I do to counteract that next time? I made these dairy-free by using Earth Balance instead of butter and So Delicious vanilla coconut milk instead of yogurt (same amount). I added a teaspoon of vanilla. I also used a GF flour mix from Arrowhead Mills. I followed all the same steps of the recipe and they turned out delicious! Best GF muffins I’ve had and I’m proud to say I made them. But will leaving the blueberries out effect the outcome much? This is such a basic recipe, I’d like to mix and match things in it, not necessarily berries. But I do worry that leaving them out and substituting, say, a little cocoa powder or a spice blend would take away from the moistness. You’re right to worry that it will affect the moistness. You could try some yogurt in their place. Take a look at the recipe we posted last for whole-grain muffins. That one’s in weight, which makes it much easier to mix and match. I’ve had such mixed results with GF baking that I had just about given up, but I found you last week and you gave me HOPE. I assembled the last of the ingredients I needed for these muffins yesterday, and baked them tonight. I had to have two (diet be damned) just to be sure that the first one wasn’t a delicious fluke! Love them, and they are much simpler to make than I thought at first. I’m looking forward to trying some of your cookie recipes soon… well, as soon as I can locate the “missing” flours. Do you buy them locally (I’m in Seattle) or all online? I have a friend that was diagnosed with Lyme disease after a long arduous trip through medicine, tests, and no diagnosis for what ailed her, was it RA, MS, or a mental disorder? No, she found a very forward thinking healthcare provider that helped her tremendously. One of the symptoms of Lyme disease in the more latent, chronic stage, is the pain due to inflammation that mimics the aforementioned diseases. So, knowing the body needed to be calmed down, the provider suggested: “No meat, no heat, no sweet, and no wheat” for one year; as these things can be inflammatory in the body. My friend abided. Not only did she lose weight, she found a healthier way of eating. I watched, I listened, and I am a believer. She has since added back in meat, lean and pasture fed, of course, lost her taste for sweet and won’t touch a bit of gluten. I don’t have Lyme’s, I am not Celiac, I have been tired of of feeling tired, constipated, bloated, and fat. I lost my MOJO! After listening, and reading, I thought, give up gluten for 30 days, what do I have to lose? Except, after two weeks, I lost the bloat, the constipation, and 3 pounds without even trying. My belly lies flatter, my energy increased. So, if for no other reasons, GF is incredible!! With so many options, and websites like yours, I do NOT feel deprived!! I feel alive!! Why is there such resistance to feeling soooooo goooood!! I have these in the oven right now and they smell AMAZING, but I think there are too many for us to go through while they’re good… Has anyone tried freezing them? They should freeze just fine. But friends might like them too! There’s definitely nothing with gluten in the recipe, although you should check the label of every package you used, to be sure. It may be the xanthan gum. I’ve since cut it out of my diet as it gives me digestive issues. Someday I’ll have enough time to modify every recipe! In the meantime, use an equal volume of psyllium husk wherever you see xanthan in these recipes. Thank you, again, for this blog, and your books. Looking forward to your next book, and please keep writing. This blog is one of my favorites. Are the 10 Tbsp of butter necessary??? I am NOT a big fan of butter. Can I use veg or canola oil instead? Would it screw up the recipe? For my first try at GF baking, I decided to make these muffins. I substituted blueberries for frozen raspberries, and I also added 1 teaspoon of psyllium husk. After baking for 30 minutes, they had risen quite nicely, so I tapped them and they felt and looked ready. Maybe I was a bit too eager, though, because the minute they came out of the oven, they slumped and looked rather sad. ). They also froze and thawed wonderfully, and the couple I kept in a container on the kitchen counter kept surprisingly well for a whole of 5 days! A question: Do you think reducing the amount of baking powder is a good idea to avoid the post-baking collapse syndrome? 😉 Maybe that will keep them from rising “too much”, and maybe not slump so much. I may also try Kates suggestion about separating the eggs and folding in the egg whites, whipped, at the end. I will definitely try this and many more of your recipes in the future. Keep up the great work! Just made a batch of these lovely muffins and they come out great! My family ate them all so I have to make another batch as they make a great snack for school. Enjoying your recipes! Thank you. This was my first attempt at cooking GF. The muffins turned out great. They’re sooo yummy. My son, who is sensitive to wheat seemed to like them too… he gobbled up the pieces I gave him 🙂 I’ve made a few blueberry muffin recipes in the past – non-gf – and I must say that these are the best I’ve ever made. I did have to substitute the white sugar for sucanat, as he also has a sensitivity to white sugar – but they still turned out great. If I keep baking, I think I’ll need to invest in a stand mixer. Thank you Shauna!! Looking forward to trying more of your recipes. I also made one of your AP flower mixes today too. We’re getting more and more set up for gf cooking in this house 🙂 I think we’ll all benefit from it. I just made these today, exactly per the recipe (something I rarely do!). They were absolutely fantastic. I went gluten-free nearly three months ago and so far have only made GF banana bread muffins, but this will definitely be my go-to ‘base recipe’ for any muffin I wish to add medium-moisture solid ingredients to (berries, baking chips, etc.). Although I’ve had a bag of sourghum flour since I stocked up with GF ingredients back in October, this was my first time working with it, and I must say the flavor gives the muffins a hint of mild earthiness that I really like. My hubby, who has no need to be GF, remarked that the texture was exactly his favorite for a classic muffin. Thank you so much for developing and sharing this recipe! You have been a lifesaver and inspiration in this gluten free journey. Have found lately that both teff flour and tapioca flour are causing tummy upsets. I made these dairy free for my two year old, and they turned out great! All I did was substitute So Delicious vanilla coconut yogurt and applesauce instead of yogurt and Earth Balance sticks. I love this recipe! I need to make some GF treats for a guest, so I’m searching for a good recipe that would not require buying great number of ingredients I don’t use regularly. I am an experienced baker but completely without experience with GF, so I bought a package of GF glour mix from Trader Joe’s. I realize that different flours measure differently and I imagine they act differently . . . but I’m wondering (hoping) if I could substitute the GF flour mix for the various flours that are listed for this recipe. The mix is made of whole grain brown rice flour, potato starch, rice flour, and tapioca flour . . . I would appreciate your advice please!